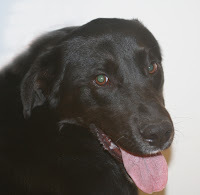 Black Lab/Springer Mix, found on Miller Avenue, Neillsville, on December 16th. A male, he has a medium-length coat that's mostly black with some white trim. He's very anxious to get back home to his family!